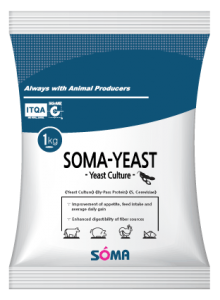 SOMA-YEAST is a multi-ingredient product containing yeast culture product, containing yeast cells, fermentation media, and yeast metabolites. It helps fiber digestion in ruminants with buffering effect, and increase appetite and better digestion in mono-gastric animals. 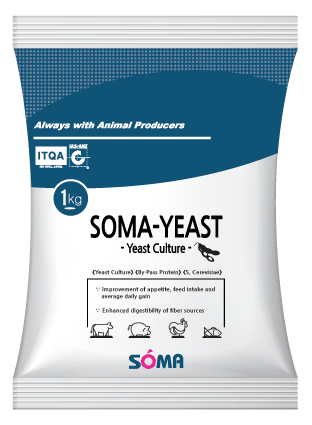 The famous yeast strain (CH-9) is used for this specific purpose. Probio-G is a multi-purpose feed probiotic which is fermented with the component of microbes according to the NRC and adapted to the intestinal physiology of the animal. It prevents diarrhea, maintaining healthy micro flora balance and improving growth performance. 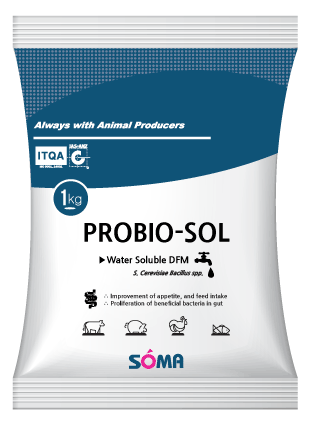 Probio-Sol is formulated by including water soluble raw materials for more convenient and consistent administration. Like feed grade probiotics, it inhibits intestinal pathogens and improves digestibility. 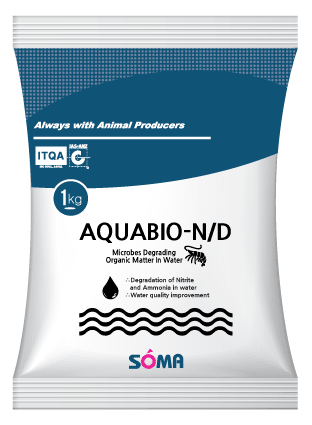 Aquabio-N/D are water soluble microbial products that has been developed to remove various pollutants including harmful gasses, contaminants in the pond. Aquabio-H/P are microbial additives that contain specific bacteria strains in order to remove Hydrogen Sulfide and excess Pyrite inside water. SOMAZYME-PT, an effective fungal phytase in pigs and poultry diets for enhancing the utilization of phosphorus with having strong heat endurance, and advanced preparation technique adopting protein modification through enzyme engineering. SOMAZYME-ANF is an compound enzyme to degrade the anti-nutritional factors in unconventional feed raw materials, focusing on correct application to the substrates for improving feed quality and lowering feed cost. SOMAZYME-101, a concentrated granular compound enzyme for pigs, has strong pertinence and actual effect to the digestive and physiological characteristics of pigs in different growing phases and anti-nutritional factors existed in the common used pig feed raw materials. SOMAZYME-303 goes feed into poultry intestine, then exert efficacy in the intestine, so SOMAZYME-303 preparation is suitable for the gut environment as pH, temperature, moisture content(viscosity) of chime. Particularly, SOMAZYME-303 was designed for solving to high viscosity problem in poultry feeds. SOMAZYME-606 was developed and produced based on the digestive and physiological characteristics of the aquatic animals and the different contents of various nutritional factors in the feeds. SOMAZYME-606 is new generation of green feed additive manufactured by SOMA Inc.